Off The Grid means no electricity. If you really want to get down to basics, it means no batteries either. Your muscles do all the work. When preparing a quick holiday cappuccino, you’ll be taking short-cuts. So this method isn’t traditional. 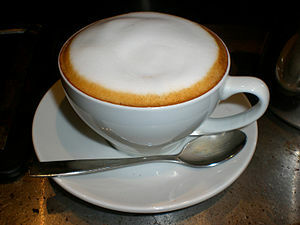 Traditional Cappuccino is an espresso coffee drink. Black coffee is poured into a cup, to which hot milk is added, and then another layer of hot milk foam is placed on the very top. To enhance flavor, powdered cinnamon, chocolate chips, chocolate powder, or carob powder might be used to top the foamed milk. Froth, or foam are the bubbles formed at the top of milk after processing. Veering away from tradition, and for the sake of saving time, here are three ways to make your Quick Holiday Cappuccino. Equipment: A glass jar with a snug lid. Hand powered shake method. Pour milk into a glass jar, leaving space for bubbles to form. Shake vigorously for about one minute. Open lid, and spoon some of the foamed milk into coffee. If the milk foam isn’t sufficient, shake some more, or use a different type of milk. Purchase a hand-powered milk frother. Follow directions that come with your frother. There are various models, from low to high priced. Some are made from stainless steel, others from glass. Here’s a link to Amazon, where you can browse hand-powered milk frothers. Equipment: Battery- powered milk frother. Battery-powered frothers are off grid, but you’ll need to keep batteries on hand to use your frother. Here’s a link to Amazon, where you can browse battery-powered frothers. Not all milk will foam. Some types of milk will foam, but won’t have much body. Experiment with your favorite milk, to see what you like. Cold evaporated milk will produce foam, and body. Cold rice, hemp, or almond milk will not foam well, or have body. Cold skim milk will foam, but won’t have much body. Cold heavy cream will foam, and have body. Cold soy milk will foam, but won’t have much body. Optional garnish: Chocolate shavings, Cinnamon, Chocolate Powder, Carob Powder. Heat soy milk in saucepan until just below boiling. Remove from heat. Stir in remaining ingredients. Beat with egg beater until frothy. Garnish with chocolate shavings, cinnamon, chocolate powder, or carob powder. Posted on December 12, 2012, in Food, Off The Grid, Recipes and tagged Cappuccino, Espresso, milk frother, soy milk cappuccino, vegan cuisine. Bookmark the permalink. Leave a comment.